Thank you for quick comment. Sorry, It’ll take some time, may be couple of updates before we’re there… The features have already been decided for next version, and I’ll plan for localization soon after it. My LiveTile always shows 999 for the unread article count. Is there a way to get that to be accurate? The GR returns correct number only up to 1000. It’s same on Google Reader website as well. Oh, I thought it was based on my cache settings. Which I have set to 200. 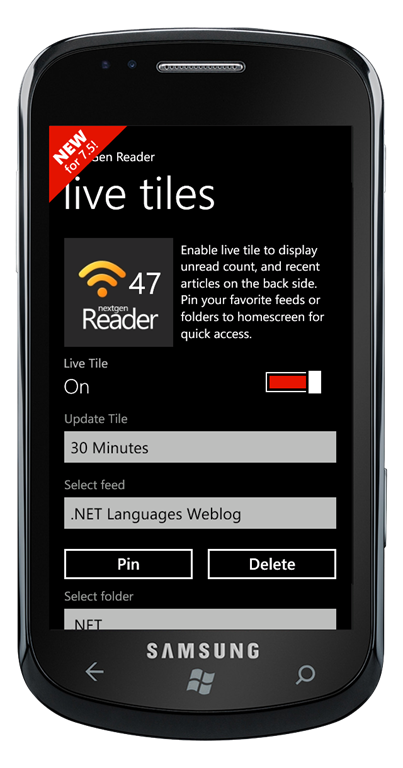 The unread count displayed on live tile is actual number. It will cause more confusion if based on cache settings. My background task doesn’t seem to be working. It says it is “off” and I am unable to turn it back on. Is this a mango bug or a problem with the app? I tried rebooting my phone but that didn’t help. I’ve improved the background tasks reliability in coming update (v2.2). Please go to “app settings”->”live tiles” page and toggle the switch from “Off” to “On” again to enable the task again. E.g. WP7 automatically disables task after 14 days, which is now handled in latest version, so as long as you’re using the app regularly, you’ll not see any issues from next version.